Every student dreads upcoming exams. Grades are very important and studying doesn’t always come naturally. 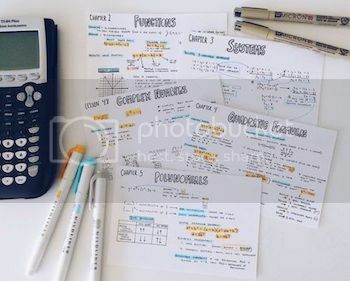 If you’re struggling to effectively study for a test, or are looking for ways on how to make your study sessions more productive, then try some of these tips! That’s right, grab a packet of highlighters and get ready to make your notes colourful! Whenever there is a key quote, mathematical formula, or important concept, highlight it! Write it out larger and then make it seem even more important with some colour. You can even use your colours to help your memory: for example, use a different colour for different subjects, or only use your favourite colour for the most important concepts. Almost every exam you take will have previous versions available to you, or another form of a mock exam for you to use as practice. The most recent tests are the most valuable, but find as many as you can to practice on. Set yourself up in the expected exam environment and then give it a go. This will help you to identify areas that you excel at, and the areas that you need to brush up on. Nobody can sit still for hours on end and memorise their notes because our brains simply can’t handle that. You are much better off to schedule in regular breaks where you stand up from your desk and go and do something else. Drink some water, have a snack, stretch your muscles, and take your mind off studying. Just make sure that you are ready to go back to the books in five or ten minutes and won’t end up on social media for the rest of the day! Most people can classify themselves as either a morning person or a night owl. Find out when your brain works the best and plan to study during those times of the day. It won’t always be possible though, because of classes or other commitments, but try your best. Also don’t forget to have a particular study area so you can concentrate. If you often find yourself staring out the window daydreaming, then face your desk against the wall. No doubt your cell phone is a great distraction, so turn it off so you can focus on your notes. Give yourself the best chance at success. Not only is sleep important to having a healthy lifestyle in general, but it is especially important around exam time. Do not stay up all night trying to cram all of your notes into your head, because that technique never works. Make sure you go to bed early, in case you can’t sleep right away because of nerves, and do whatever it takes to ensure that you are well-rested come the morning of the exam. If you are tired and yawning while studying, let alone trying to take a test, you’re lessening your chances at achieving a good score. Studying and passing exams can be a difficult task, but the suggestions above are ways that you can set yourself up for success. Once you figure out your method to studying, stick to it, and don’t give up. Good luck for your exams!